On 12 February the Minister for Regional Development announced a review into the Department of Economic Development, Jobs Transport and Resources’s regional service delivery model and the best policies to drive economic growth in regional Victoria. The Victorian Government is committed to driving sustainable economic growth in rural and regional Victoria. However in recent years, economic growth in regional Victoria has slowed and major regional sectors such as manufacturing have faced challenging conditions and have been forced to cut jobs. The formation of an External Advisory Board that includes business, local government and community leaders from across Victoria. A program of targeted stakeholder engagement. Inviting input and ideas from all interested members of the public. Building on the considerable strategic planning already undertaken by regional leaders and communities across Victoria to identify the best new options to drive sustainable economic growth in rural and regional Victoria. The review covered the programs and services currently delivered by the department, including within Regional Development Victoria (RDV), agriculture and biosecurity services, and transport. Prof Jane den Hollander, Vice-Chancellor, Deakin University. The review was supported by a project team within the Department of Economic Development, Jobs, Transport and Resources. 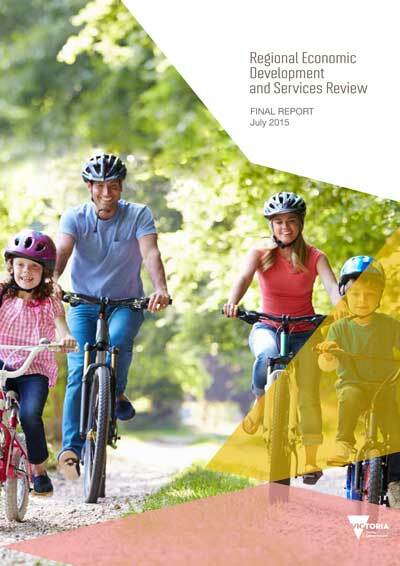 The External Advisory Board has considered the input of individuals, community groups, councils, and industry leaders about what matters most to people living and working in regional Victoria in providing this report to Government. The Victorian Government carefully considered all of the recommendations in the Regional Review and has responded with Victoria’s Regional Statement, which outlines the Government’s vision for and commitment to regional Victoria. The Regional Statement acquits all of the 'high priority' recommendations in the Review and draws upon the input from stakeholders that was gathered throughout the consultation process.